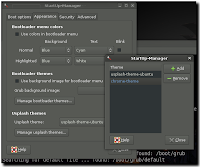 There are many different looks you can give to your boot screen by adding more themes to usplash, the program which displays the splash image at boot time. You can install a number of them using Synaptic by doing a search for usplash. You can also download different themes online (see below). Go to the Appearance Tab at the top of the page, and click the Manage Usplash Themes button at the very bottom of the dialogue. Now click the Add button and navigate to where you extracted your files, and select them, (They should be .so files). 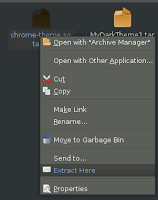 Close the Manage themes dialogue box. Once you have installed your themes they should appear in the scroll box under Usplash Themes in the Appearance Tab. Select the theme you would like from the scroll box, just click on it and select. Before you close the StartUp-Manager, check that the settings in the Boot Options Tab under Display are correct for your monitor. I had to change mine to Resolution: 1024×768, and Color Depth: 24 bits.